One of the favourite day trips from our summer cottage on Georgian Bay is to a lakeside patch of granite everyone calls “Painted Rocks,” even though it has no such name on the map. It’s a spectacular place, where the mysterious forces of deep nature are hard at work, on a time scale you can scarcely imagine. We always venture there when we have guests because it’s only 15 minutes away by motor boat, 30 minutes by canoe. The shoreline takes your breath away, both by its present day-beauty (spartan, raw, and rugged, like a moonscape if you ignore the water and trees) and for what it shows about the origins of the earth, billions of years ago. What’s there to see? 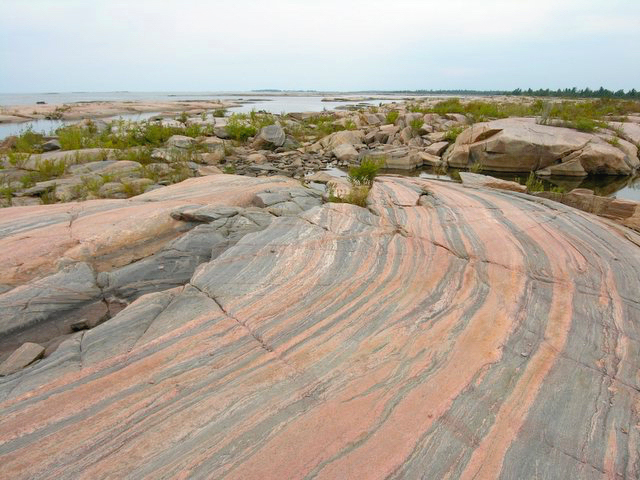 Several acres of exposed, pink and grey gneiss (see below) running in veins and swashes, as if painted by some mysterious super-being. The rock is in definite layers with a common grain orientation, sometimes intersected with thin bands of other rocks and colours (like deep black igneous or white quartz). The surface shows signs of erosion, both glacial, and more recently by water. And it also features many pools of warm water and myriad tiny wildflowers, like you’d find in an alpine environment. There’s so much to take in as you walk, both big and small; we never tire of the place. Beyond is Georgian Bay, water beckoning as far as the eye can see, with the odd large sailboat or cruiser on the horizon, or perhaps a group of kayakers navigating a route close to shore. The wind is almost always blowing, a westerly, from the lake to the shore. Soon after we discovered Painted Rocks 10 years ago, I read about its geology, in accounts that seemed frankly unbelievable. Today’s rocks were apparently formed underneath a mountain range on the scale of today’s Himalayas. This all happened 25 kilometres below the surface, at temperatures of up to 1200 degrees Celsius. Such enormous pressure and heat transformed the minerals in the earth’s mantle and created the layers, bending the solid rock like so much plastic. Really? Mountains? The story sounded preposterous. 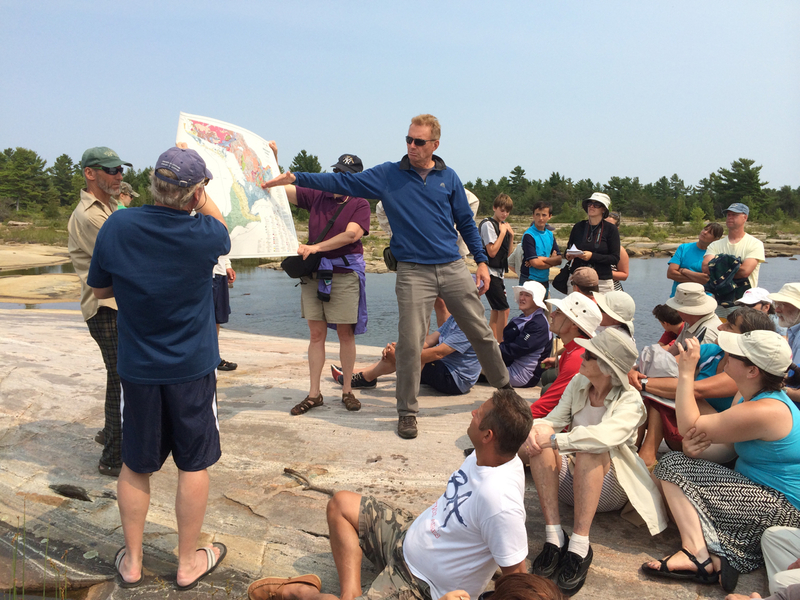 But then our cottager’s association organized a walking tour of Painted Rocks in 2014 with U. of T. geologist Nick Eyles (right). He confirmed the history, starting his talk by pointing at the ground below our feet and declaring, “Right here, these rocks are the smoking gun of plate tectonics.” As he explained, the rocks were formed under a great mountain range, which itself was created by the collision of the earth’s tectonic plates, just like the Himalayas are being created today. One of the first questions asked of Eyles was, “So, where did the mountains go?” It’s hard to stand on this frying-pan-flat shoreline and not wonder this! His answer: they eroded over the course of 600 million years; their sediments were washed westward and now lie deep underground, roughly in present day Alberta. (My skepticism returned: How the heck do they know that?) As the mountains dissolved, the underlying gneiss rose to the surface. Finally, the more recent erosion of this rock is what gives the sandy beaches of Killbear Park near Parry Sound their characteristic pinkish hue. Even the secondary roads in this area sport the same colour, since they’re constructed of gravel made by crushing local rock. Ayles wears a t-shirt with this pun: “Have a gneiss day.” (That’s your pronunciation guide to this geological term.) Technically, gneiss is granite that has been transformed further by great pressure. It displays “foliation”, alternating layers of different minerals – the ‘paint’ of Painted Rocks. And it’s criss-crossed by “dykes”, vertical cracks in the horizontal rock layers that got filled with newer, molten mantle. 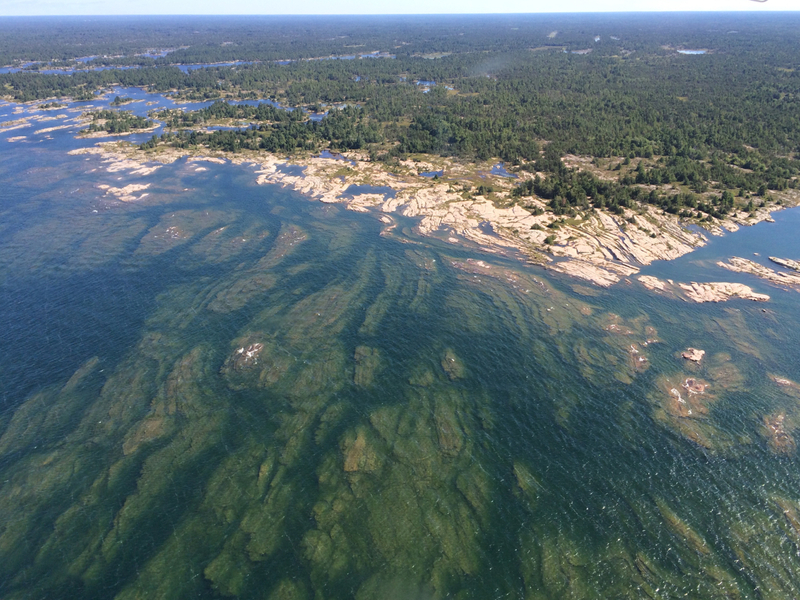 Looking at the rocks, it’s tempting to think of them as sedimentary – surface material laid down over time, like the limestones of the Bruce Peninsula just across the bay. But as Eyles explains it, gneiss is quite different. The rock’s mineral origins are from below, and the layers are like the butter in puff pastry or croissants, squeezed thin by the rolling-pin-like pressure of the mountains above. At Painted Rocks, these layers stand on end, like a felled tree trunk, the horizontal turned vertical. This type of rock is everywhere in northern Ontario, but it’s mostly covered by more recent sedimentary glacial deposits and of course by vegetation. You get to see gneiss in artificial rock cuts as you drive on highway 400, especially south of Parry Sound. And here, at the edge of the lake, with water levels lower than the historical average, a lot of “new” (i.e. unburdened) rock has been exposed, and is not yet covered in lichen, which will soon turn these rocks a monotone green-grey if they remain above water. This makes it a great place for a walk, a picnic, to fly a kite, or even to swim. On the weekend, you’ll probably have company, but during the week you can sometimes have the expanse all to yourself. Someone asked Eyles about fluctuating water levels in Georgian Bay (they were quite high at the time of our walk, two summers ago, but had been a good two feet lower before that, scaring the dickens out of cottagers with shallow water access). He shrugged, and answered (I’m paraphrasing), “This lake has been hundreds of feet lower, and also much higher – nothing is forever.” He really didn’t seem that concerned. Gulp. You humble me, Dr. Eyles. Last year, we had the good fortune to fly over Painted Rocks in a float plane (click to enlarge photo, if you’re on a desktop computer), a birthday present from my wife, sons and her parents. Even though I knew roughly what to expect, it was still a revelation to peer into the water just offshore and see all the shoals and shallows. On a stormy day, this is a fearsome place, with the water churned up like a soapy washing machine. The bay in front of Painted Rocks is not navigable by motor boat (the marked, safe channel is way offshore), but the kayakers love it because the rocks and shoals offer fascinating channels, and some protection from the wind. You can wander up the shore from where we land on the right of the photo above, but not very far. Eventually, you get stopped by the mouth of the Naiscoot River (top left). However, with all there is to see under your feet, this limitation doesn’t much matter. I’ve taken people to Painted Rocks who walk so slowly – they’re staring, dumbfounded, at the ground – that I fear we’ll never get home for dinner. Painted Rocks is on crown land, part of the North Georgian Bay Conservation Reserve – not a park, but a protected, mostly wilderness coastline between Bayfield Inlet and Britt. There are no facilities here, but almost nobody litters. The only trace of humans you’re likely to see is the odd firepit, crude stone constructions to shield flame from the wind. At the end of it all, Painted Rocks is a place for the head – you can examine the geological clues that have been all figured out by scientists like Nick Eyles. But it’s also a place for the heart, reminding us of our smallness in space, and especially in time – and of the ultimate endurance of our special planet, and our fragility as a species. Painted Rocks are at the mouth of Charles Inlet, about 8 kilometres by water from the end of Highway 529A at Bayfield Inlet, GPS coordinates 45.643461, -80.582437 or google maps here. Here is a link to Nick Eyles’ popular guide to Ontario geology: Road Rocks Ontario. Georgian Bay never ceases to amaze. Thanks Art. A great summary for those of us who missed Nick Eyles’s presentation. Many thanks!